Ryan Seacrest and Larry King dined at Wolfgang’s Steakhouse last week. It’s a great place for steaks and cocktails. Wolfgang’s Steakhouse was 100% full at 8pm on a Friday night. It’s not Puck’s, it’s another lively place on N. Canon Drive in Beverly Hills. People come from all over Los Angeles to order the Porterhouse for Two. It’s a filet mignon on one side and a porterhouse steak on the other. It large enough for two, three of four people to share. While looking over the menu, we listened to the lively piano music played by the talented Aldolfo Alexi, while sipping on refreshing mojitios. We started with a Jumbo lump crabmeat cocktail. It arrived in an iceberg lettuce bowl with cocktail sauce on the side, and a plate with spicy horseradish, saltines and Tabasco sauce. Wolfgang’s salad was also in an iceberg lettuce cup with diced tomatoes, green beans, red peppers, shrimp, Canadian bacon and large chunks of onions. If you love onions, you will enjoy this salad. The salad is tossed in a very light vinaigrette to reveal the true flavors of the fresh vegetables, shrimp and bacon. If you love steaks and chops, this is a great destination. The steaks are U.S.D.A. Prime Dry Aged in their own aging box. They offer a 16 and 8 oz. 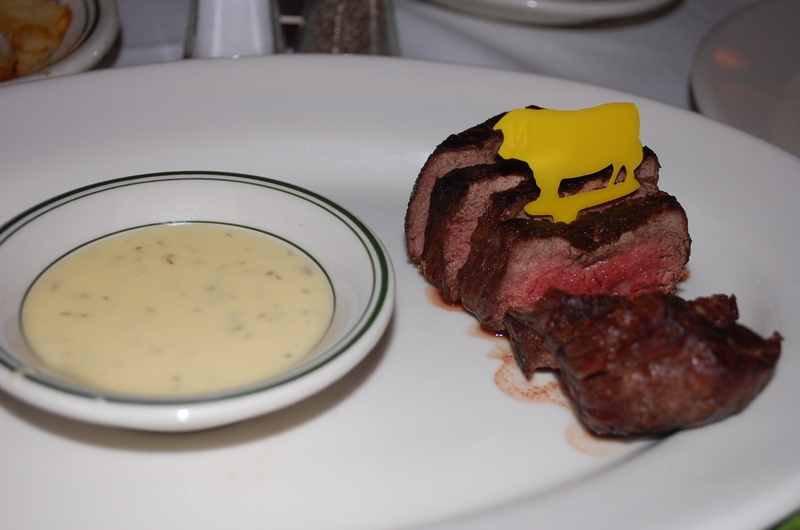 filet mignon, Prime NY Sirloin steak cooked and sliced to perfection, a Rib eye steak, lamb and veal chop. But what if you don’t like red meat? Wolfgang’s serves a delicious grilled Chilean seabass, Alaskan wild salmon and Yellow fin tuna. All arrive in large portions without heavy sauces to hide or blanket their true taste. It’s simple and high quality food. Some of the enjoyable signature side dishes are the German potatoes or “hash browns,” the creamed spinach, sautéed mushrooms and onions, giant potato chips and creamed corn. All can be shared by two or more people. For dessert we had to try the apple strudel with house made “mit schlag” (whipped cream) and vanilla ice cream. As I excused myself to visit the ladies room I was pleasantly surprised when I entered. Finally, European-style state of the art commodes in America. Not only are the seats heated, but also there is a push button control panel with buttons to cleanse with warm water and to dry. With locations in Park Avenue, Tribeca, Waikiki Beach, South Beach and Mexico City, we are lucky to have a Wolfgang’s in Beverly Hills. It’s high quality food prepared to provide the most natural flavors. As we left at 10pm, the restaurant was still 100% full. In today’s economy, that is rare to see. 445 N. Canon Drive, Beverly Hills – (310)385-0640.